Keep in step with the SF-S0637 Twist IN Stepper with Handlebar. Stepper uses a "step in" motion which creates a larger hip rotation. This hip rotation allows for more muscle activations in the quadriceps and glutes, thus burning more calories. The convenient handlebar can assist with balance and be used to increase the step rate. During the "Twist IN" motion the core is more engaged and is used to stabilize body. The Twist IN Stepper has oversized non slip foot plates and sturdy steel construction to give the confidence to workout hard. LCD digital monitor keeps track of strides per minute, time, step and calories with the easy to read built in. 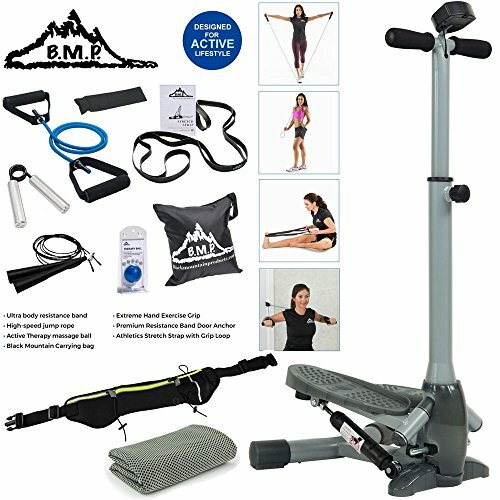 Keep you fitness focus and reach your goals with Sunny Health and Fitness SF-S0637 Twist IN Stepper with handlebar. This stepper machine is low impact and very soft on the joints, letting you work out longer and harder reducing the pressure on joints.